Figure 4 shows a schematic diagram of a DO detector used in the fluorescence method. This method uses the quenching phenomenon of oxygen to calculate the level of DO. Fluorescence from a fluorescent material excited by light from a blue light-emitting diode (LED) is quenched by oxygen passed through a DO permeable layer. The higher the DO level is, the stronger the quenching phenomenon is and the less fluorescence the detector (light-receiving diodes) detects. Oxygen (DO) enters the light-emitting material layer through a DO permeable layer made of silicon or some other material. This light-emitting material layer contains pyrene and other materials, which are excited by the blue light from the blue LED in the center and emit fluorescence. This fluorescence is quenched according to the amount of oxygen (DO) that reached the light-emitting material layer, and the remaining fluorescence that was not quenched is received by light-receiving diodes. 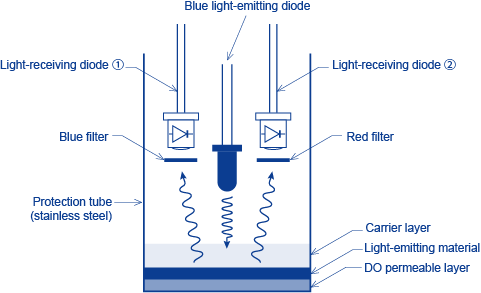 A light-receiving diode with a blue filter and another with a red filter are used. They only detect the remaining fluorescence and calculate the DO level through mutual subtraction. In principle, the fluorescence method has higher measurement sensitivity with lower DO levels, while higher DO levels cause noise and lower the measurement accuracy. In this method, a blue LED with an emission wavelength of approximately 360 nm and light-receiving diodes that can detect approximately 0.001 second of light at a wavelength of approximately 800 nm are used. We provide a system that uses this method for industrial use (installed in field sites). The fluorescence method for measuring DO levels is a relatively new method, and has recently become widely used for measurement in field sites as it does not require replacement of the internal solution.